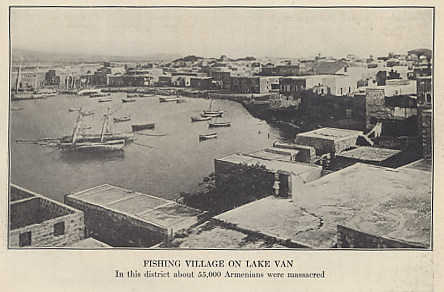 Photograph of a village on Lake Van, an area of Turkey populated largely by ethnic Armenians. The area was one of the first targeted on a large scale when Turkey turned on its Armenian citizens. Photo from Ambassador Morgenthau's Story by Henry Morgenthau, American Ambassador to Turkey from 1913 to 1916. Armenia was a region of the Ottoman Empire in eastern Turkey, along the borders with Russia and Persia. Armenia is a region in Turkey.